On the Apalis Txx / Colibri Txx, the shared USB Client/Host port can be used to download a new OS image. This is only required if the Bootloader doesn't boot anymore. If your module still boots, you can use the Update Tool (Only for Windows CE at the moment). Instructions are also available as video. Check our reprogramming guide. In order to flash a new image into an Apalis/Colibri Txx module you first need to put the module into recovery mode. If your module runs the Embedded Linux BSP LinuxImageV2.0Beta1_20121218 or later stop at the U-Boot prompt and use the U-Boot command enterrcm. Connect USB micro B to the X12 connector on the Iris board and USB A to your PC. To enter recovery mode short the pad 1 and 2 of the JP1 on Iris using a wire. Power up the Iris board. Connect USB Standard B or Micro B to the X29 or X30 respectively on the Eval board and USB A to your PC. Power on the Eval board. Press and keep pressed (or hold) the recovery mode button SW9 and immediately press and release the reset button SW8 on the Eval board. After 2-5 seconds, release the recovery mode button SW9. Please have a look at the datasheet of the Colibri T30 in the recovery mode section. For more information have a look at the datasheet of the Apalis T30 in the recovery mode section. Please have a look at the datasheet of the Apalis TK1 in the recovery mode section. 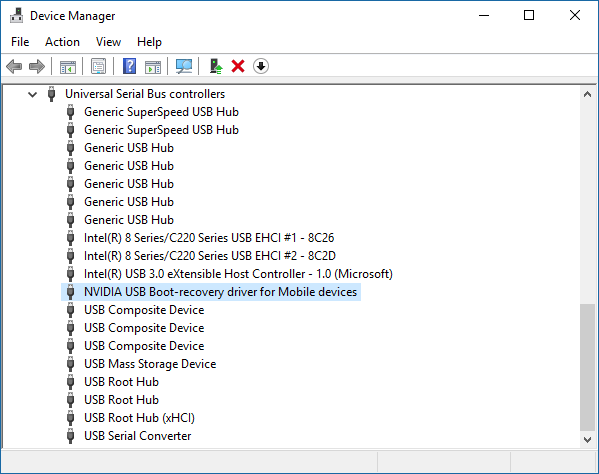 When the Apalis/Colibri Txx module enters the recovery mode, it will be available as an USB device in the device manager. Please connect the client port of the carrier board with your development PC. Depending on the carrier board you need a different cable. 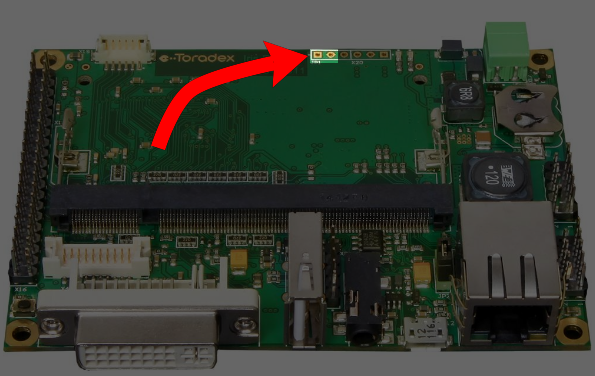 Toradex' standard base boards utilize different USB Client Port connectors (Type B, Mini B, Micro B). 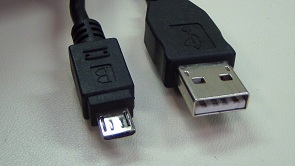 Use a USB A to micro B cable. Important: The Recovery Mode only works with USB 2.0 High Speed (480Mbps). The Iris Carrier Board and the Evaluation Board V3.1A are the only Toradex Colibri carrier boards which support USB 2.0 High Speed (480Mbps) by default. 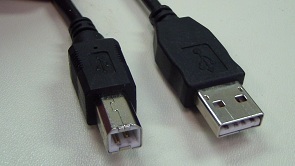 Use a USB A to micro B cable (X9). Note: JP2 must not be populated in order to configure X9 as the USB Client port. 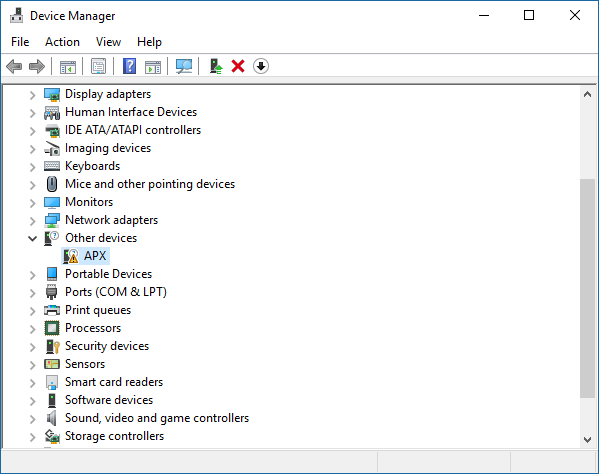 If you have successfully entered the recovery mode the Module will show up as APX device on your development PC. 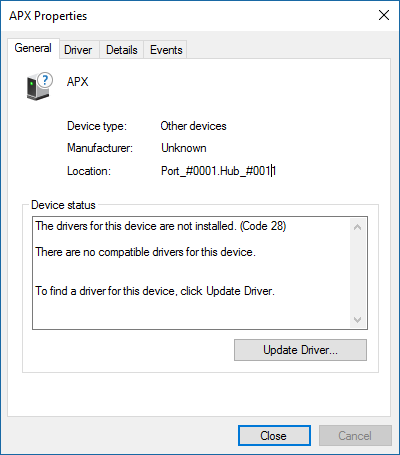 You can now install the APX drivers. The driver is part of NVFlash / Recovery mode package. 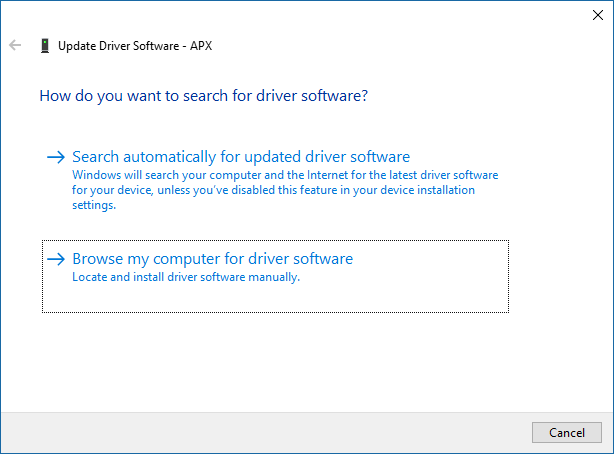 This driver works on 32-bit and 64-bit Windows systems. 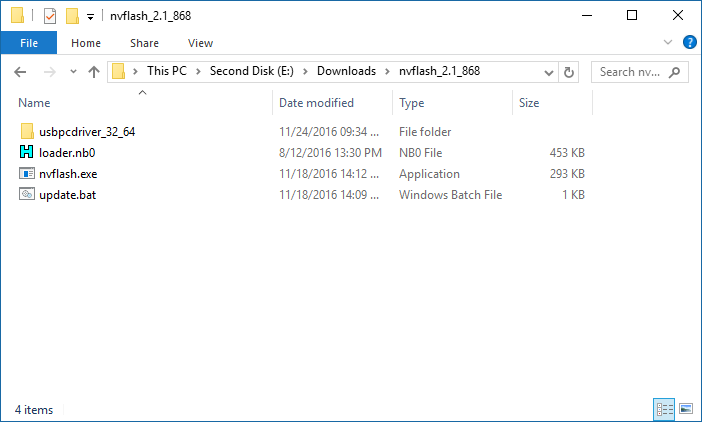 Note: Earlier NVFlash and batch script were already in the image download package. Do not use them any longer. 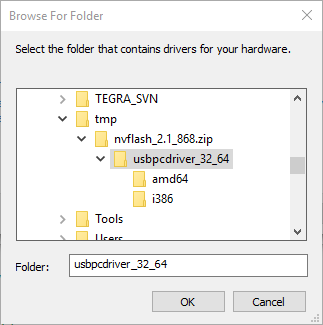 Note: If you get a warning about a unsigned driver, make sure you download the latest signed NVFlash driver (At least nvflash 2.1 868 of the NVFlash / Recovery Toolset). 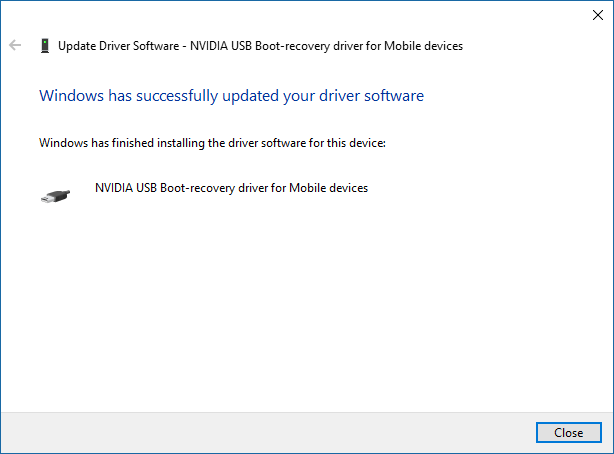 In order to verify if the recovery driver is properly loaded open Control Panel->Device Manager. Double-click update.bat. 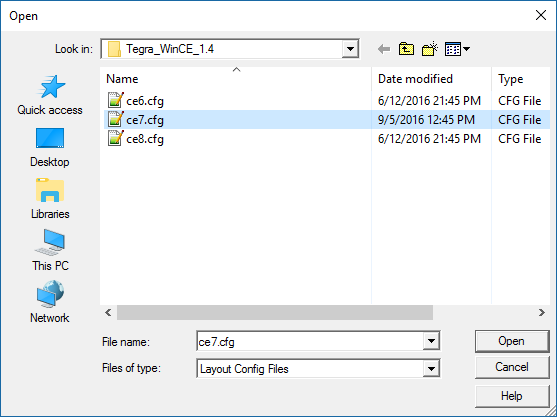 You are asked to select the *.cfg file according to the Windows CE version you want to flash. Locate the *.cfg in the Image you downloaded before. This will delete all data on the module, including registry, flash file system and config block. The module's hardware revision and serial number (mac address) are automatically backed up and finally restored as part of the process. Once the image gets successfully flashed you will get the following messages (shown for WinCE7 on Colibri T20). Execute the update.sh shell script as contained in the Embedded Linux demo image packages with the -d (debug parameter) to download U-Boot directly into RAM. 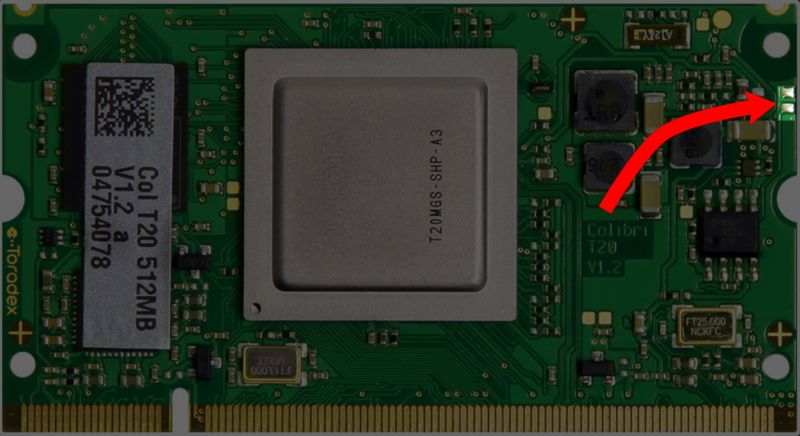 On the Colibri T20, additional parameters are required to specify the module type/version: '-r 512' for 512 MB RAM modules and '-v V1_1' for V1.1B or V1.1C modules. 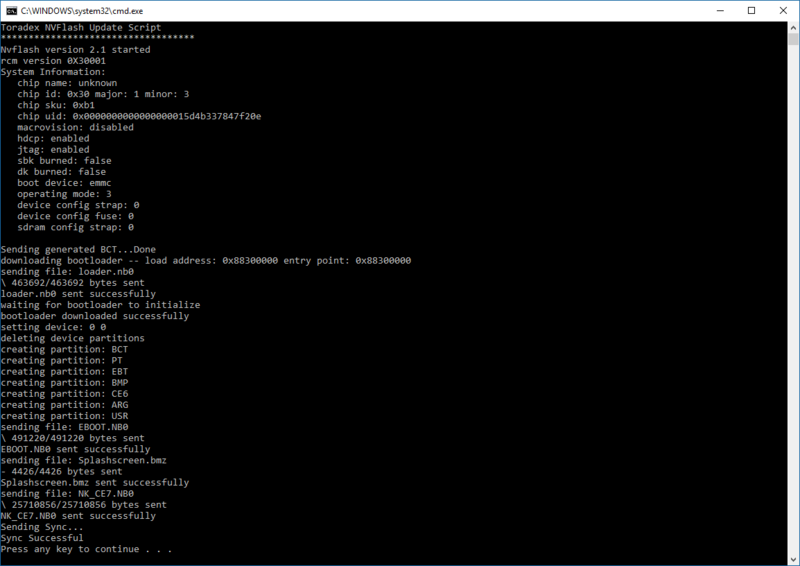 Then, after inserting a prepared SD/microSD card (as populated with './update.sh -o <path to card>'), the actual flashing can be initiated on the serial debug console using the 'run setupdate; run update' commands. 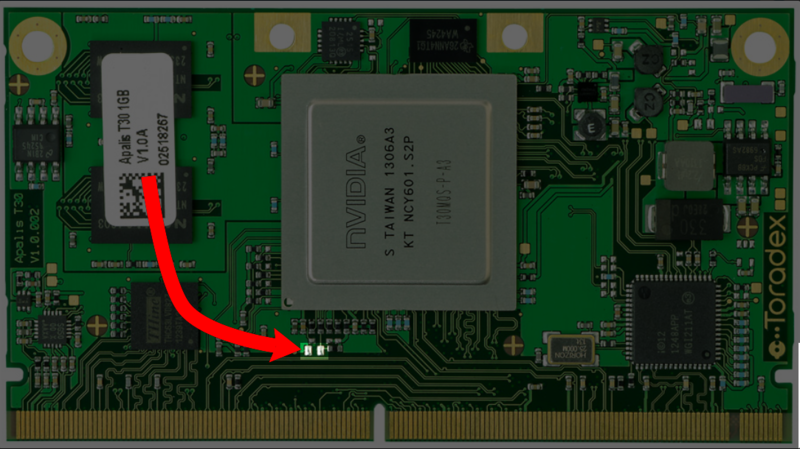 Further details can be found in the Flashing Embedded Linux to Tegra Modules article. Do you like to program Windows CE 6 or CE 7? To fix this problem you need to connect the pin to 3.3V while in Recovery Mode. If USB client detection remains an issue even after updating Windows CE, the voltage divider has to be patched with lower resistance resistors. Connect the 2 pins directly on the module to enter the recovery mode. Refer to section Directly on Txx module. This problem is fixed in the Win CE bootloader V0.1 beta 7 and newer.